Second rule of Fight Club: you do not talk about Fight Club. 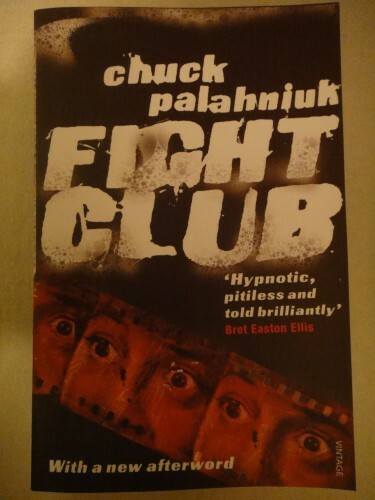 Allow me to break the first two rules and talk about Fight Club, Chuck Palahniuk’s debut novel and still his most famous. When writing this review, it’s difficult for me to divorce my impression of the 1999 film from that of the book. The two are similar, inter-linked, two sides of the same object. I’d even say that they complement each other; so watching/reading one makes it worth reading/watching the other. You wake up in a post-modern novel. When you have insomnia you’re never really awake, but you’re never really asleep either. The narrator goes to support groups to help with his insomnia: testicular cancer, flesh-eating bacteria, organic brain dementia. I cry, then you cry; babies don’t sleep this good. Until Marla shows up. Liar. Faker. Marla doesn’t have testicular cancer. Marla doesn’t even have testicles. You wake up on a plane. You meet Tyler Durden. The narrator’s house blows up. He’s got nowhere to go. And that’s how he ended up living with Tyler in a rundown hovel in the toxic waste part of town. I am Imran’s overbearing devotion: Fight Club is brutal satire, it’s a sarcastic commentary on 21st century culture and all its rampant materialism. The fast cars and the branded underwear and the careers. You are not your job, you are not how much money you have in the bank (that’s from the movie). It’s about pointless rebellions and emasculated men beating each other senseless. If that doesn’t sound like your cup of tea, it’s because it’s not supposed to. Fight Club is an uncomfortable book and an uncomfortable movie and it’s the kind of thing that’s worth engaging with to take you out of your comfort zone. And it’s good, a flawed gem perhaps, but maybe a minute is all you can expect from perfection. On the novel in particular, the style is great. The tone is detached and cynical, the descriptions dry and sarcastic. Palahniuk does have a tendency to overdo it with the shock value at times. The book examines many of the little idiosyncrasies and injustices of our modern culture, casts a jaded look at things we might not have noticed. And turns a lot of them on their heads. ‘Black comedy’ sounds like a fitting description. There’s also a look at this narrator himself, this subdued man being driven crazy with boredom. His monotonous job and his ‘perfect’ life with its floor-to-ceiling windows in their aluminium frames and it’s Haparanda sofas with the orange slip covers and his stainless steel dishwasher-safe Alle cutlery; and it’s abject loneliness. If any of this sounds vaguely familiar then Fight Club is almost definitely not what you need, but it’s a slap to the face; maybe a wakeup call. The movie and the book both have their merits; both are worth looking into. I am Imran’s lacking conclusion: Fight Club is a brutal satire, a sarcastic commentary on 21st century materialism. Maybe it’s also the story of a lonely man. A twisted book and an engaging movie.